Today I'm going back in time again to hit Gundam SEED, which came out in 2002. As the title suggests, this is another series based in the venerable giant-mecha-beating-each-other-up Gundam series. So, is Gundam SEED another mindless action thrill ride... or does it dig deeper? Gundam SEED does indeed share some similarities with my previously reviewed series Valvrave the Liberator, although these are almost entirely superficial in nature. Except for T.M. Revolution, whom did the first opening theme for both series. Oh Sunrise, you really were trolling Gundam SEED fans, weren't you? On the other hand, Gundam SEED shares a striking number of similarities to my favorite video game of all time: Ace Combat 5: The Unsung War. Although still very different, the themes present (particularly the latter half of both) are actually very similar when you think about it. Somehow I get the feeling that there is a subtle influence from Gundam SEED on Ace Combat 5. That aside, let's talk about Gundam SEED. On the whole, I loved the third opening too (possibly even more), but that one has some spoilers, so I'll leave it off. The Gundam designs in this series are pushing the limit of this category. I thought they were very nearly "great". The artists and general designers for this set of Gundams did an impeccable job. The Gundams are all very unique (weapons-wise) and they are just different enough to tell them all apart during the heat of battle without feeling disproportionately different. The striking color palate that the series uses probably has a great deal to do with this. Gundam SEED has all the ingredients to be a great, mindless action series... and it wasn't. Gundam SEED decided to dig deeper and find something else it wanted to be. It decided to become a great action series with a conscience. To answer that, we need to examine the deep themes and internal conflicts that are present in the series, because they, and not the action, are what drove this series. And guess what? It worked. First, the central conflict of the series (at least the first half) could have easily have degenerated significantly in melodrama, terrible cliches, and a disappointing resolution. This conflict, of course, is Kira and Athrun: two friends caught on two different sides of the conflict. I think that this is best conflict of its kind I've ever seen in terms of its handling, the tact they took with it, and the eventual resolution of it. You want to root for Kira, he's our main character, but at the same time Kira doesn't want to win; winning entails one of the friends killing the other. This conflict gets excellently weaved into the underlying theme of the series: what is an enemy? Particularly in the second half of the series, this theme becomes extremely prevalent. Gundam SEED is eager to point out that, in reality, there is no real enemy... or is there? Maybe there is. If you can't tell who the real enemy is, then when will the war you're fighting ever stop? This moral grey area exists in the real world too. It is easy to label an enemy, but it is difficult to define why they are an enemy. This leads to another interesting theme that actually was quite prevalent in Japanese media in the early 2000's (which I'm curious to know about why): the consequences of soldiers blindly following orders. When you label an entire people as the "enemy", where does the war end for soldiers. Will it end when the commanders have decided that it has, when the "enemy" is destroyed, or will it be when the soldiers themselves decide that the time to stop is now? If the killing continues, then won't that just lead to more killing? Also, the series touches on a reality that we all avoid thinking about in real life: in war, we all treat soldiers like numbers on paper. An uncomfortable topic, but certainly one that needs to be explored. I think that this is one of the rare series that I've seen that was definitely good in its first half, but the second half was even better. Many series will start off good and taper off with time. Gundam SEED is not one of them. I'd argue that the second half very much eclipses the first half (which again, was already good) in nearly every way. The second half of the series ramps up the tension significantly and tackles an even wider array of themes and conflicts that the first half only hinted at. It takes a suddenly mature stance on its subject matter, in opposition to what previously was a pretty childish show (relatively), and asks a bunch of harsh questions on the reality of war. Oh, if the episode number starts with a "3", followed by another number above 3, it is probably amazing. I disliked the dub so intensely that I stopped watching it and swapped with the subbed. Yeah, it was unfortunately that bad. This is a big opinion, clearly, but I just can't get over it. Even then, the sub has its own problem with Kira's voice actor. Any time Kira cries... I almost laughed. Is this another Japanese/American cultural divide or did he really overdo it every time? Similarly, there was some serious subtitle slipping in the version I watched. I'm not sure that they were official subs, but it they were... wow. You always got the gist of what was going on, but misspelling basic words, punctuation slips, improperly formatted timestamps (we shouldn't see those pop up when watching), and extremely confusing sentences (I only remember one example, but it was a big one) is getting a bit much. For reference, the version I watched was the one listed in the information section. It is the official streaming option for the show. Sometimes in the remastered series, the animation gets a bit bumpy. In the remastered series, many of the scenes were redone, so it is obvious (painfully so) when the original scenes were left in. Sometimes it gets really bad when large portions of the episodes seem to be unaltered. For how long the series gets, some members of the cast (read: many of them) don't get nearly enough character development. Some characters don't get very fleshed out at all and those that do are a bit lacking sometimes. Backstories for most of the characters are surprisingly nonexistent. I'm still not entirely sure on the exact history of Kira and Athrun beyond that Athrun left and Kira was supposed to follow him at some point. Similar lapses in background information happen for a lot of the cast, and it makes it a little difficult to relate to some of them. Lastly, like many 50-episode anime, the series hits a rather slow pace near the middle that is unmistakable. Without sufficient willpower, some people might write the series off before the second half (which is better) starts. I have to say, I loved Gundam SEED. It is probably one of the high points in the Anime Marathon. I've seen Gundam series before, but they never resonated on a storytelling level with me; SEED did. The tough thematic elements surrounding friendship, war, and loss, when coupled with the intense, deep conflicts, are enough to drive this series into great territory. It only gets tugged back down a bit by the hallow-feeling characters and the sometimes slow mid-series plot. Of course you'll want to watch Gundam SEED if you want to see giant mecha beating each other up, but there's a lot more here than that. SEED is a series that could have been a mindless Gundam show, but it instead became so much more. It has a story that even giant mecha haters will appreciate on its merits. It won't resonate with everyone, but I think too many people will write this off as another Gundam show. This plot would work if you replaced the Gundams with fighter jets. The mecha don't matter, the plot does. 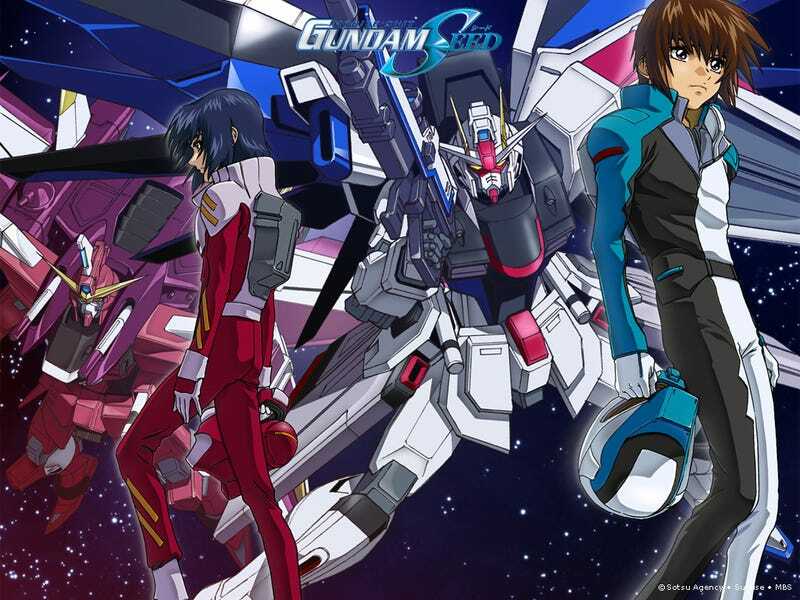 The remastered Mobile Suit Gundam SEED is available for streaming on Youtube. I've linked this to the first episode, after that the playlist at the top of the related videos bar will lead onward. As usual, I claim no ownership of the images herein. Header was pulled from here. Again, nothing on tap. Gundam SEED is done, so a couple of series on low priority have been bumped up.